Male Townsend's warbler photographed by Christian Kelly. Townsend's warbler is a colourful little songbird with distinctive markings around its face and throat on males. It has a black mask forming a small yellow crescent moon under each eye, a black throat, and black side stripes. Its chest is yellow, fading to white as you approach the lower body and underside of the tail. Males have darker, bolder markings than females and juveniles, and solid black throats whereas females and juveniles have streaked throats. For additional photos and to hear the voice of Townsend's warbler, please click here. 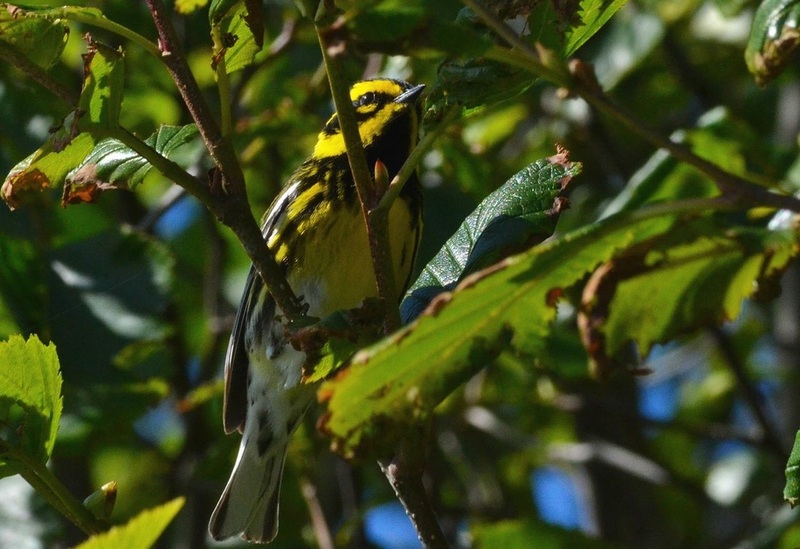 Townsend's warbler is found in the coniferous forests of coastal and inland BC in the summer months, where it migrates for the breeding season. In they winter it is found on the Pacific Coast of the southern United States and in Central America. There is a small contingent this species present year-round in southwestern British Columbia. The females and juveniles especially may be confused with other, closely related species. However, none of these species' ranges extend to BC's Central Coast. Townsend's Warbler, Setophaga townsendi. The Birds of North America Online (A. Poole, Ed.). Ithaca: Cornell Lab of Ornithology; Retrieved from the Birds of North America Online. Accessed 02/09/13. Dunn, J. L. and Alderfer, J. (Eds.). (2006). National Geographic Field Guide to the Birds of North America. (5th Ed.). Washington, D.C.: National Geographic Society. P. 384.